I just completed my eighth renewal of my Master CFI. The Master Instructor Program is run by Sandy and JoAnn Hill has been a large influence in any success I have had as a flight instructor. I highly recommend pursuing professional accreditation through the master program to every professional instructor. I got on very early in this program when it was still part of NAFI and I just finished my eighth renewal (this also renews my CFI certificate). Pilots are goal oriented people and after I had earned all my instructor ratings and worked for several years I was running out of steam....what is this all for anyway? The continuing education units you need to accumulate to achieve the master designation got me again taking courses and instruction, and pushed me into the arena of public presentation. Participation in this program "raised the bar" of what I was trying to achieve and led me to a greater appreciation of the professional nature of flight instruction. This program is the brainchild of Sandy and JoAnn Hill, both former teachers, and is carefully constructed to not just recognize achievement but also bring out the best in flight instructors and engender further professional growth. Though NAFI was the original portal for the Master CFI program and this organization is still a functioning entity, it has been diminished significantly by the loss of JoAnn and Sandy Hill several years ago. This parting was acrimonious and entirely unfair to the Hills. They have since reinvigorated their Master Instructor program as Master Instructors LLC. Their stated purpose is: to provide "a national accreditation for aviation educators based on advanced professional standards and rigorous peer review." 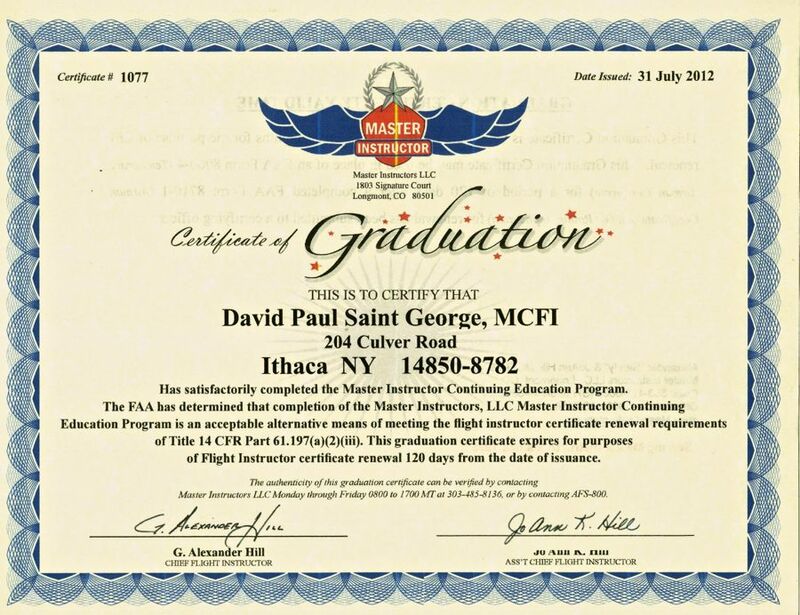 The Master recognition also means automatic award of an FAA "Gold Seal" and renewal of your flight instructor certificate.